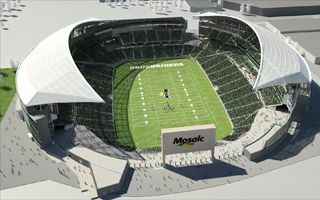 “A spectator roof and improved lighting and seating are essential features of our new stadium,” said Brent Sjoberg, Deputy City Manager & COO, executive lead for the Regina Revitalization Initiative. A company out of Dallas, Texas will begin installation of 130,800 square feet of polytetrafluoroethylene (PTFE) fabric roofing in the spring of 2016. The material is translucent which will allow maximum daylight and also provide shading. Around 400 LED lights will illuminate the stadium and make it CFL’s first one to be fully lit with LED lighting.